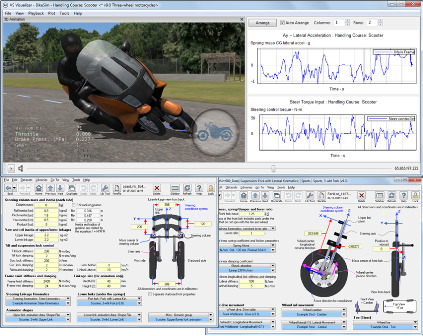 ANN ARBOR, Mich., May 21, 2015 - Mechanical Simulation Corporation is proud to announce the release of BikeSim 9.0 vehicle dynamics software. According to Dr. Michael Sayers, CEO and Chief Technology Officer, "We are in the process of upgrading all of our products, starting with CarSim 9.0 last year, and finishing with BikeSim this month. This is the most comprehensive upgrade since Mechanical Simulation was founded in 1996. BikeSim 9.0 has major enhancements to the math models, the visualization tools, the database, and the overall architecture." Three-wheeled motorcycles are now in the market with two wheels in front, and BikeSim 9 adds a three-wheeled motorcycle, with the two front wheels connected by a lean-link system. "The three-wheeled model includes the full 3D nonlinear kinematics motions of the suspension, such as camber change, toe change, Ackermann steer, etc. These go far beyond the characteristics of conventional two-wheeled motorcycles," explained Dr. Yukio Watanabe, chief developer of BikeSim. Numerous improvements were also made to the existing math models, such as extending the tire model to handle asymmetric data, and increasing the number of add-on features such as sensors, payloads, etc. The number of roads and target paths was increased dramatically in support of customers developing Advanced Driver Assistance Systems (ADAS) technologies. Other parts of the software package were also modified extensively, or in some cases, replaced completely. The plotting tool used since the earliest versions of the software has been replaced with plotting capabilities within VS Visualizer, the tool used to generate videos for simulated cameras. Plots and videos are now synchronized. For more information on BikeSim 9.0, please visit www.carsim.com. Visualizer provides interactive synchronized video animation and plots for a three-wheeled motorcycle in BikeSim 9.0.